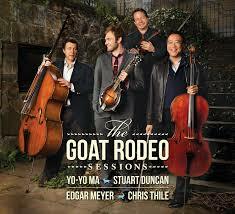 The Goat Rodeo Sessions was an ambitious and groundbreaking project that brought together four string virtuosos: world-renowned cellist Yo-Yo Ma, fiddler Stuart Duncan, bassist Edgar Meyer and mandolinist Chris Thile. These artists — each prominent figures individually — came together as a unique ensemble for this project. The music, including two tracks with female vocalist Aoife O’Donovan, crosses several different genres. While visiting Google New York they performed a few selections from their new record. After the performance the group chatted with Lauren Carpenter about music and technology. This entry was posted on December 26, 2017 by Vox Populi in Art and Cinema, Music, Opinion Leaders and tagged Aoife O'Donovan, bassist Edgar Meyer, fiddler Stuart Duncan, Goat Rodeo Sessions, mandolinist Chris Thile, Yo-Yo Ma.